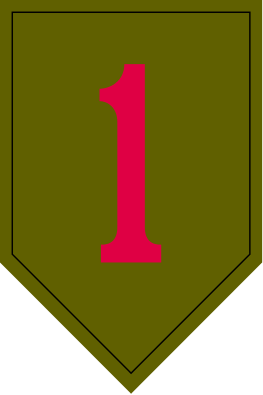 The 1st Infantry Division first saw combat in France during World War I. It was the first American unit to fire at the Germans, and was responsible for the first American victory of the war- it captured Cantigny. The division next captured Soissons, then fought in the Meuse-Argonne Offensive during which it advanced to Sedan, the farthest point past German lines any American unit got during World War I. The division next fought during World War II. As part of Operation Torch the division landed in North Africa and then fought the Afrika Korps. It then landed in Sicily, fighting and winning at Gela before advancing through the Sicilian mountains. The division then fought in Operation Overlord- it was in the first wave of troops to land on Omaha beach. After fighting inland and helping to capture St. Lo, the division launched a continuous assault through France, eventually capturing Aachen. The division then fought in the Battle of the Bulge and helped stop that German offensive. The division then fought through the Siegfried Line and helped encircle German forces in the Ruhr pocket. It managed to fight into Czechoslovakia before the war ended. During the Vietnam War, the division fought from 1965-70, fighting in famous operations such as Operation Bushmaster I and II, Operation Marauder, Operation Cedar Falls, Operation Attleboro, and Operation Junction City. It also fought during the Tet Offensive and the resulting US and ARVN counter-offensives. During the Gulf War, the division was one of the first to breach Iraqi defenses, then launched a 160 mile advance through Iraqi lines. The division destroyed almost a thousand Iraqi vehicles and neutralized thousands of enemy soldiers in just 100 hours. Next, the division provided peacekeeping forces in Bosnia. The division served in Iraq during Operation Iraqi Freedom and the resulting anti-terrorism missions from 2003-2011. It was then deployed to Afghanistan to fight the Taliban. In 2014, the division was deployed back to Iraq to fight ISIS.